1 Set the balsamic vinegar on a simmer to reduce to 1 tablespoon. Only do this with unaged medium quality balsamic vinegar. For 10-15 year old vinegar, use 1 tablespoon, as is. 2 Blanch the tomatoes for 2 minutes in unsalted water on a heavy boil, drain and dump into ice water. After cool, peel and seed the tomatoes, then coarsely chop. 3 On a medium heat, sauté the onions, anise stalks, and celery, for 2 minutes until soft. Add garlic and sauté for another minute on a low heat. 4 Add a dash of salt and pepper, bay leaves, and ½ cup of stock, basil, oregano, and reduced balsamic vinegar. Simmer for 15 minutes. 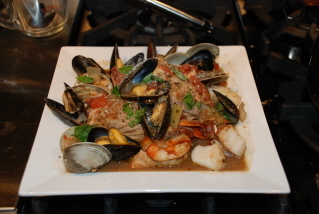 If fresh basil is used, wait until the mussels are added later. 5 Remove the sprig of anise and add another ½ cup of stock. Simmer for another 10 minutes. 6 Add clams and simmer for 6 minutes. 7 Add shrimp and fish, and simmer for another 4 minutes. 8 Add remaining ingredients and simmer for 5 minutes. 9 Serve in flat bowls with cracked pepper, parsley, and shaved parmesan. This is a heavy seafood stock, useful for strong soups like zuppa de pesce or bouillabaisse. 1 Sauté anise, onion, garlic, and celery in a large pot for 2 minutes until soft. Reduce heat to simmer and simmer for 15 minutes, stirring or sauteing occasionally. 2 Add remaining ingredients and bring to a boil. Reduce heat and simmer for 20 minutes. 3 Let stand for 10 minutes, then strain through cheese cloth or a fine strainer. Do not pass any of the particles at the bottom of the pot through the strainer. 4 Simmer for 20 minutes if any reduction is required. The stock will be salty from the mussel and clam liquor. It’s unlikely that you’ll have to add salt, so avoid the temptation to season at the beginning of cooking. Author: Randall S. BeckerSource: Heck’s KitchenThis isn’t your traditional fish stock. It’s really good when a heavy salty seafood taste is needed.